Our Architectural Salvage store features over 16,000 square feet of display space filled with quality items both modern and historical. And we get new items every day! Stop in and browse. Whether you want to get a great buy, find a unique item, or save the planet, there is bound to be something for you! (We are just West of Dewey Ave. on the South side of the road. We do not have an on-line store, but you can see a few of our products at the following sites. Why Shop at The ReHouse Store? Bargains! If you’re remodeling, sprucing up, or just maintaining your home or property, you can save a bundle here at ReHouse on used building materials. You can buy a top of the line used door, cabinet or bathtub for less than the cost of a basic new unit at one of those super stores. Or get a perfectly good basic unit far less than new. Unique Items: We have items that you just won’t find anywhere else. Do you own a historic home or like a touch of history in your newer home? You can buy antique wood trim, door knobs, leaded glass, and more at The ReHouse Store. Or you might prefer a custom piece of a more recent vintage. 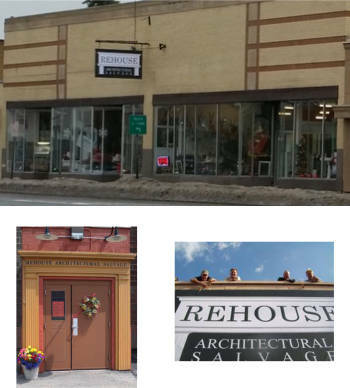 Improve Your Community: Shopping The ReHouse Store is good for the environment! ReUse of building materials saves the resources and energy required to make new materials and reduces the waste flow to landfills. And when you buy from us, you’re supporting a locally owned business that is redeveloping an existing building in the city of Rochester and creating jobs ... helping the local economy. All merchandise is sold "As Is" without warranty. Salvaged merchandise may have defects in appearance, finish, function, structure, or otherwise. Safety of equipment is not guaranteed. It is the buyer's responsibility to have it inspected and repaired by a qualified professional. Returns - Items may be returned within 7 days for store credit. All returns must be in the same condition as when purchased. Items returned within one business day will be refunded in the same form of payment as used to purchase the item (i.e. cash, credit card, check, etc.). Non-functioning radiators, furnaces, or appliances returned within 7 days will be refunded in the same form of payment as used to purchase the item. All other refunds are in the form of store credit. No refunds after 7 days. Holds - A 25% deposit will hold an item for up to 5 days after which the held item is returned to the sale floor. Deposit refunds requested within one business day will be provided in the same form of payment as used to purchase the item (i.e. cash, credit card, check, etc.). Deposit refunds requested after one day will be provided as store credit. Children: We love kids but ... The ReHouse Store is laid out in a warehouse style and many of the products on display are not very “kid friendly”. It may be best to drop them off at Grandma’s house first. But if you do bring them along, please plan to hold their hand while you browse the store.